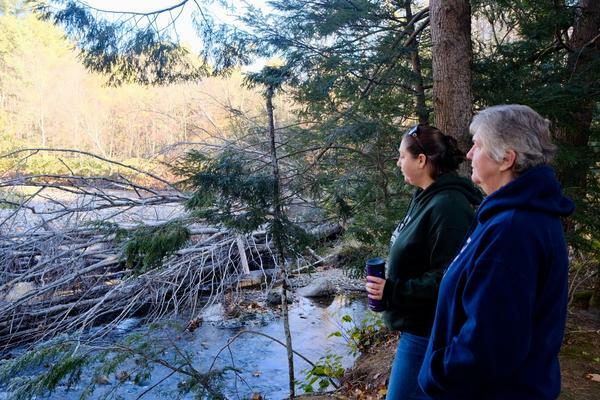 The water swept away campfire rings, knocked picnic tables across the property, destroyed a road and bath house, and dropped all kinds of debris, she said. It was symptomatic of a changing climate here. Scientists say New Hampshire is seeing more frequent heavy storms, powerful rain and snow events that are overwhelming stream banks and drainage systems. For Lent and her business partner Carole Clark, it’s meant several floods in recent years of their most desired, waterfront campsites. The issue, they say, is on their minds with the election coming up. Climate change and environmental policy has historically broken along party lines, with Democrats pushing more aggressive action, and Republicans raising skepticism about the real risks. That’s true in the New Hampshire’s top races this year, those for governor and both congressional districts. But Lent is an independent, and she said she hasn’t decided how she’s going to vote. To a certain extent, her uncertainty reflects the fact that climate change doesn’t seem to be a key political issue this campaign season. It’s eclipsed by others, including the cost of energy and healthcare, and things like the opioid crisis. She was enjoying a quiet lunch recently with her family in Waterville Valley’s Town Square. Just across the way, at the local pub, Mark Phillips was having lunch as well, taking a break from the stone pillar he was building for a new welcome sign for the town. Phillips lives in the town of Lisbon, on the other side of the White Mountains. He said he, too, cares about environmental issues, in part due to an interest in photography and the outdoors. But he doesn’t believe that human-driven climate change is occurring. After all, he said, we just had snow in October. He’s a Republican and, while he’s not necessarily a fan of Donald Trump, he said the president’s policies seem to be working, at least on the economy. That focus on the bottom line reflects the Republican message this year in New Hampshire when it comes to the environment. Both incumbent Governor Chris Sununu and Congressional candidate Eddie Edwards say we need a market-driven approach to any changes in energy policy. And, among those who care most strongly about climate issues are people who are already seeing it impact their bottom-line. Ian Cullison, for example, runs the cross country ski center at Waterville Valley, which has been affected by warmer winters in recent years. Climate change shouldn’t be a Washington political football to be punted around, he said, but instead something to talk about, and vote on, now.